Provost Alan M. Garber announced the creation of a new senior post, vice provost for advances in learning, as a way to focus faculty and institutional engagement with efforts to enhance education across Harvard. 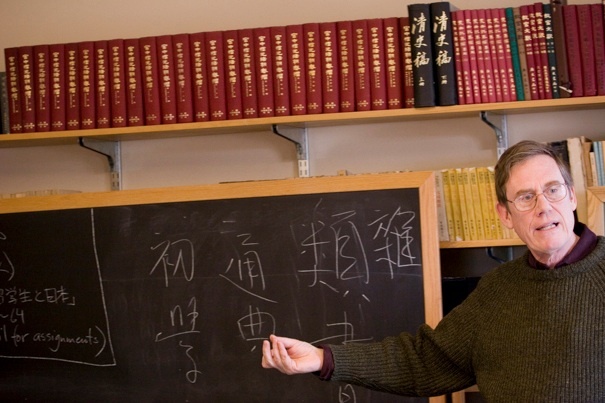 Carswell professor of East Asian languages and civilizations Peter K. Bol will assume the role immediately. Together, the announcements suggest accelerating efforts to apply technology to teaching and to rethink pedagogy on a school-wide scale across Harvard. Science faculty members have redesigned introductory classes, made hands-on laboratory experiences widely accessible, and used interactive devices to assess learning in real time—all out of concern about losing students who might otherwise fail to pursue their passion for science, technology, engineering, or mathematics (part of a larger national discussion about this phenomenon). The Harvard Initiative for Learning and Teaching (HILT), catalyzed by a $40-million gift during the University’s 375th-anniversary celebration, has created a forum for discussing the issues across campus, and backed experimentation and innovation with seed grants—including, it turns out, to HSPH (see below). The edX online-education partnership with MIT, launched in the spring of 2012, has jump-started experimentation with the use of technology in virtual and campus teaching contexts. HarvardX now has its own production staff and studio to accelerate online course development, and HILT and HarvardX are collaborating to train faculty members and graduate students to incorporate the new technologies in their courses and teaching. Individual schools are also investing in their own teaching-support infrastructure, as in the appointment of the first faculty director for the Faculty of Arts and Sciences’ Bok Center for Teaching and Learning: Robert A. Lue, who is also faculty director of HarvardX. It is within this context that Provost Garber announced the appointment of Peter Bol as the new vice provost. In a conversation, Garber noted that there had been “an explosion of interest in how we approach teaching and learning at Harvard”—dating especially from the gift that launched HILT in 2011. That does not mean that every faculty member is suddenly eager to offer online courses, he emphasized; but “more and more faculty are interested in being involved in some way” in rethinking their teaching. That has created the need for a dedicated position responsible for stimulating further work on improving pedagogy across the University, serving as a source of information and guidance for interested professors—and making clear that “faculty should be leading these efforts.” The new vice provost, Garber said, should be someone “who is actively involved in teaching and in innovation” (as Bol is and will continue to be), in order to maintain contact with students and direct experience in the evolving Harvard classroom. More than a decade ago, he and graduate students reported from Zhejiang Province, south of Shanghai, where they were digitally documenting local village and community life; electronic databases, videos of lineage halls, and other tools were incorporated into a course on “The Culture of Everyday Life in China” that he taught with professor of Chinese history Michael Szonyi. He has applied database technology to the vast archives of Chinese leaders through the millennia, creating new opportunities for digital scholarship while engaging colleagues in the United States, China, and Taiwan. Those efforts have been married productively to his academic leadership of Harvard’s efforts to use geographic information systems and geospatial technology in a host of scholarly disciplines—including developing a new course that was supported by a HILT innovation grant. He was, as Garber’s note observes, chair of the Harvard academic computing committee, and now is a member of the HarvardX faculty committee. There's a bigger question about online education, of which MOOCs are a small piece. MOOCs will be important for self-motivated learners and people who can't get access to a high quality education. We don't view them as a substitute in any way for what we can offer undergraduates. But, MOOCs are something that Stanford can offer to improve the quality of education available worldwide. A separate question is whether technology has a role to play in improving the quality of the educational experience right here on campus or at our overseas campuses. A lot of our current focus is on how we make some of our classes, particularly large lecture classes, much better learning environments. How do we use technology to improve our pedagogy? We are very committed to that goal. And we would do that independent of whether we kept class size the same or expanded it. Garber stressed that edX and HarvardX have a three-part mission: to make Harvard professors’ teaching available worldwide; to improve teaching on campus; and to support research on teaching, learning, and the effectiveness of education technologies in the classroom. Most discussion of MOOCs and edX during the past year has focused on the first of these goals, he said; “Peter Bol is committed to all three.” The most effective learning, the provost said, continues to involve extensive face-to-face interaction among faculty members and students, augmented by making the best use of new technologies. HSPH, according to the announcement, plans a broad effort to “redesign its educational strategy.” This past May, at the HILT conference, Dean Julio Frenk outlined his school’s centennial-year curricular plans. He talked about redesigning instruction to focus on competency-based learning, with flexible, modular, experiential units accommodating students at various points in their professional lives. He also endorsed the “blended” online and class-based teaching techniques of the flipped classroom. The mix of online and face-to-face instruction, he said, would vary with the purposes, with more online teaching for “informative,” expertise-oriented learning, and progressively more personal instruction for “formative” (values and professional) and “transformative” (leadership) courses. He then reviewed the institutional challenges: colleagues (investing in faculty development); capacity (physical space, technology, finances, and so on); and culture (changing from language that describes a professor’s teaching “load” to give teaching a value equal to research; the rewards for teaching and research; and the school’s self-identification as a preeminent research institution). View the video recording of Frenk’s HILT presentation here. According to Ian Lapp, associate dean for strategic educational initiatives, Frenk began planning to revisit HSPH’s curriculum and pedagogy some three years ago, reflecting his awareness of both changing needs for public health and evolving learning methods and technologies. On November 1, the school is devoting a centennial symposium to the subject and its aspirations. But it is one thing to envision an initiative for “Transforming Public Health Education,” as the effort is now called. It is another to be able to afford to effect it. HSPH is by a very large measure the Harvard unit most dependent on sponsored-research grants (73 percent of fiscal year 2012 operating revenue, according to the University’s annual financial report), and least able to count on endowment funding (14 percent of operating revenue)—precisely the circumstances that make it most difficult for a dean to finance changes in curriculum and pedagogy. Hence the importance of today’s announcement. The Charina Endowment Fund and Richard L. Menschel, M.B.A. ’59, and Ronay Menschel are making available $12.5 milllion to underwrite the planned changes in master’s degree education, to be in place in 2015, and the new doctoral program, beginning next year. (The new education funding comes atop $2.5-million of earlier support from the endowment fund and the Menschels in support of Ariadne Labs, an HSPH-Brigham and Women’s Hospital initiative, lead by Atul Gawande, professor in the department of health policy and management, and professor of surgery, to reduce surgical errors, increase childbirth safety, and enhance planning for end-of-life care.) The new education-initiative funding—combined with an anonymous 2012 gift of $5 million to HSPH for curriculum development and scholarships for the doctoral program, plus a $500,000 grant from the Medtronic Foundation—will also support the broad makeover of curriculum and pedagogy, including plans to create facilities suitable for “innovative and team-based” teaching, according to the news release, and to enable HSPH faculty members to collaborate with peers in other Harvard schools. This combined funding, totaling $18.3 million, shows a remarkable level of philanthropic interest in, and commitment to, public health education in the U.S. and globally. It positions us well to continue to educate the public health leaders of tomorrow. As soon as this fall, students at the School will begin to benefit from the generosity of these gifts through the enhanced classroom experiences they will encounter. Public-health students preparing for leadership roles in government, non-governmental agencies, and private firms need both in-depth knowledge in specialized areas of public health and a wealth of competencies that enable them to work collaboratively across the wide range of disciplines involved in improving the world’s health. We are re-envisioning our approach to education in our professional programs to enable our students to meet the rapidly changing needs of the field. We support Harvard School of Public Health with our philanthropy because we believe in the importance of public health and the opportunity to expand the knowledge and skill sets of future public-health leaders through the use of technology and case studies examining evolving health challenges. Improving learning leads to better prepared students who can more successfully address the major public health issues facing the world today. Better educated public-health leaders have the capacity to improve the health of us all. supporting Harvard Business School’s year-long leadership fellowships in public, social, and nonprofit enterprises. Richard Menschel has served on the business school’s visiting committee, on the art museums’ director’s advisory council, and on the Committee on University Resources (Harvard’s principal fundraising advisory body). He was national co-chair of the University Campaign, which concluded in 1999. The Menschels are also parents of three Harvard daughters, according to the HSPH release: Charis ’97; Sabina ’99, M.B.A. ’05; and Celene ’04, M.B.A.’13. At HSPH, Richard Menschel has served on the dean’s council and the leadership council, and chaired the school’s fundraising committee during the University Campaign. He will be honorary co-chair of the forthcoming capital campaign, to be unveiled after The Harvard Campaign festivities on September 21. For a relatively lightly endowed enterprise like the public-health school (whose graduates almost by definition do not earn high incomes), the long-term friendship of strategic philanthropists like the Menschels—in both financial support and volunteered personal engagement—could not possibly matter more, especially in a time of actual and threatened wholesale reductions in federal research support. Will future online education become limited to professional degrees?